Dr Angus Brown and colleagues have been offering chemotherapy at Stephen Terrace Veterinary Clinic for over twenty years now. Unfortunately cancer is a common diagnosis in pets. With advances in veterinary medicine and diagnostics, we are increasingly able to understand more about how cancer works and we also have more options to treat and manage this horrible disease. This is good news for our pets, as this provides more options for humans to consider on behalf of their animal family. Treatments may be curative, but certainly many pets can have improved quality of life, and often may live longer, while living with cancer. Treating cancer may include surgery, radiation therapy, and chemotherapy, either as solo treatments or in combination, just like people living with cancer. Chemotherapy may be indicated and recommended, if surgery cannot guarantee complete removal of cancer cells in local surrounding tissue, or if surgery cannot remove cancers already present in multiple sites in the body. Chemotherapy involves careful selection of a drug or series of drugs, diagnosed to kill cancer cells, to either cure your pet’s cancer, or to slow the progression of the disease. The aim of chemotherapy in veterinary medicine is to treat in a way to minimise the chance of side effects to these medicines, to enhance the quality of, and hopefully extend, your pet’s life. These medicines are administered either orally, by injections or through intravenous fluids. These medicines, almost without exception, need to be given at the practice. Chemotherapy drugs circulate through the body and are usually fully eliminated through urine or faeces within 48 hours of administration. They are designed to kill cancer cells “hiding” throughout the body. Many of the drugs we prescribe, are also used in human cancer treatment. Because our focus must be on your pet’s quality of life, this may mean aiming for extended periods of remission from active cancer, rather than cure in all cases. For this reason, we are often treating less aggressively than in human oncology, and so doses of drugs may be lower. This helps limit the side effects of these medicines. Thankfully, the vast majority of pets, experience no side effects to cancer drugs at all. Most of the remainder, experience transient, mild symptoms, which in most cases do not require additional supportive treatment. These include inappetence, nausea, diarrhoea. Chemotherapy makes us all more prone to infection. Total hair loss is rare for our pets. Coat thinning occurs at times, and hair regrowth is slowed. Cats may lose their whiskers! Some populations of cells in a healthy body multiply at faster rates than others. The gastrointestinal system (our gut), the immune system (our bone marrow, spleen, lymph nodes and circulating blood cells), the skin, and the reproductive tract, all have rapidly dividing cells. So compromise to these body systems, may result in the type of adverse effects described above. Remember, most pets do not experience side effects at all. However, even if some symptoms are mild, our vets will proactively aim to reduce these before subsequent doses of chemotherapy medicines. This could mean, for example, using anti-nausea medicines at home to keep our pet’s appetite and strength up. After careful decisions between you and our veterinarians, regarding whether chemotherapy may be appropriate for your pet, we will explain exactly what is involved. From the outset, the agreement between us must focus on your pet’s quality of life. This may mean pausing or stopping treatments at any given time. This is part of our Conscience Contract, together. Depending on the type of cancer, the intervals between treatments and the length of proposed treatment plans can vary enormously. The type of treatment (eg. tablet, intravenous injection, or together with intravenous fluids), may be different than the last treatment administered. 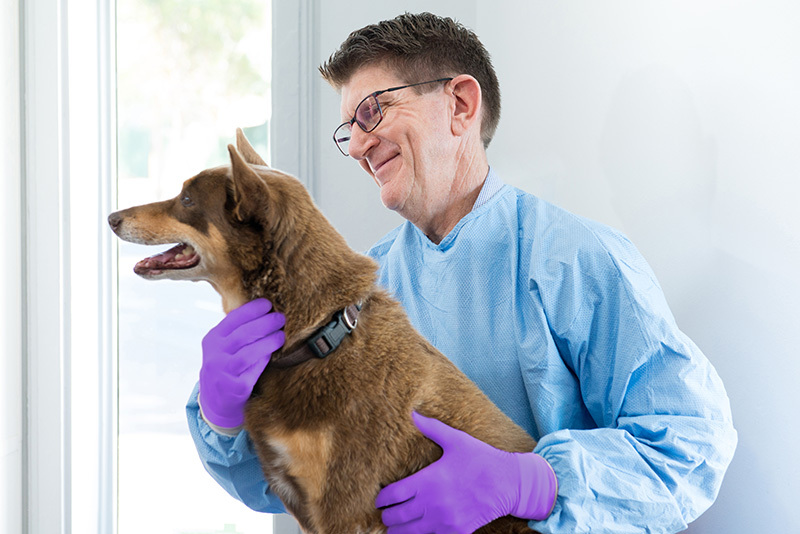 In between treatments, we perform check ups, including a blood sample, to ensure that your pet is well enough to have the next chemotherapy dose. There are a few situations, where under our guidance, drugs are given in tablet form at home. However most drugs need to be given, at the practice. If you are dosing at home, you would wear gloves to protect you from contact with the drug. All chemotherapy injection treatments, occur in the hospital. In addition to gloves, our team wear protective clothing and glasses, to limit potential direct contact with these liquid drugs. Some treatments only take a few minutes, in which case you wait and can take your pet straight home afterwards. Some treatments take longer and we may admit them for a couple of hours. When your pet leaves the practice, they may have a small bandage on their leg, covering where an intravenous catheter has been (just like when your pet has, when they have many other routine hospital or surgical procedures). You will be instructed when and how to remove the bandage at home. While in theory, there are potential risks for pet owners, these are no greater, than people living together with partners or family members on a cancer journey undergoing chemotherapy. Regardless, sensible precautions are obvious. Most of these drugs leave our bodies via urine, faeces (at times they can be present in saliva) and are fully eliminated within 48 hours of treatment. For this period after each treatment it is logical to wear gloves, when cleaning up accidents inside. Use disposable items including paper towel, place things in a lined bin or plastic bag, and wash your hands thoroughly afterwards. If bedding, pet coats etc are soiled with excrement or vomit within 48 hours of treatment, wash on a hot cycle twice or discard. Urine and faeces passed outdoors, is best hosed off pavers, paths verandas and into soil close by. Toileting on soil or lawns, may be hosed in, but solid faeces can be left for 48 hours in direct sun where UV light will deactivate potential residues in this time frame. While sensible precautions are obvious, please also remember that your pet is looking for your support during this time, so ensure you balance this with your usual strokes and cuddles! There is never going to be a “one size fits all” answer. Also, remember not to let anybody “judge” any decision you ultimately make. Veterinarians and indeed the whole team at Stephen Terrace Veterinary Clinic are here to support you come to a decision, but also support the decision you make. Also, you might change your mind on this journey – that is fine too. We will always respect you and your decision, because you know your beloved pet the best. However, all our decisions together need to be based on our Conscious Contract – aiming for a disease and / or symptom free quality of life at all times. Chemotherapy involves a significant commitment in time and resources, ultimately with no guarantee of success. Some cancers behave more predicably than others and at times we can give you some guidance with respect to potential time we might anticipate gaining. Sometimes, with available information, pet owners elect to not proceed with intervention in the light of a cancer diagnosis. This is totally fine, as long as we focus on your pet’s remaining time with us to be quality time. It is also respected and understandable when owners elect for a timely euthanasia, rather than risk their pet’s life deteriorating further.